Provided photo Troy High School’s pop a cappella choir, The Troy Tones, will be the featured entertainment for the YWCA Evening Dessert at 7 p.m. Tuesday, Jan. 22. 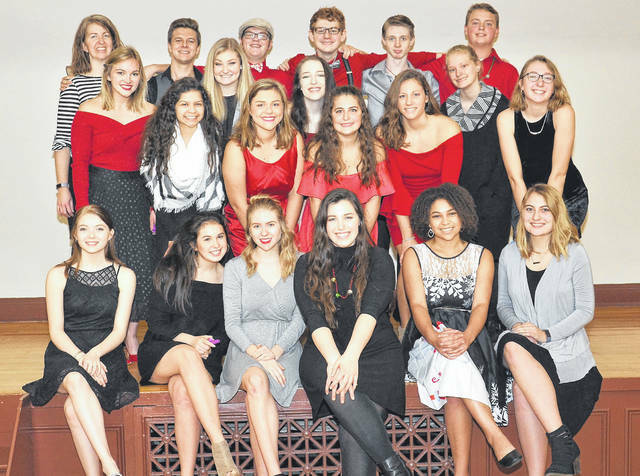 PIQUA — Troy High School’s pop a cappella choir, The Troy Tones, will be the featured entertainment for the YWCA Evening Dessert on Tuesday, Jan. 22, at 7 p.m. The group, directed by Rachel Sagona, consists of 20 students who rely only on their voices for the music they make. Members include Josalyn Abrams, Brandon Allen, Grace Avey, Tristen Benner, Clayton Captain, Aaron Carmack, Taylor Dankworth, Jaiden Flory, Amanda Griffith, Irene Hinojosa Porras, Abby Johnson, Riley Johnson, Bri’Anna Lovato, Jessica Loy, Mackenzie Nosker, Jordan Reed, Angie Rice, Macie Sadler, Molly Sanders, Gabe Shelton, Breann Stith, and Jenna Stockslager. The Troy Tones perform at every THS choir concert and throughout the community. Following their performance, YWCA Program Director Beth Royer-DeLong will unveil the 2019 YWCA travel plans. Cost for the Dessert Evening is $5 per person. Reservations must be made by Monday, Jan. 21, by calling the YWCA Piqua at 773-6626. The YWCA is handicapped-accessible. https://www.dailycall.com/wp-content/uploads/sites/30/2019/01/web1_Troy-Tones.jpgProvided photo Troy High School’s pop a cappella choir, The Troy Tones, will be the featured entertainment for the YWCA Evening Dessert at 7 p.m. Tuesday, Jan. 22.